This week has been a fairly normal one. A night out at the pub on Saturday, but otherwise quite a quiet weekend. On Monday we had a home visit from the Motor Neurone Disease Association which was really helpful as they were able to offer quite a lot of help, advice and support to Mum and Dad. Regular readers will know that Mum has recently been diagnosed with Motor Neurone Disease and we are still trying to come to grips with it as a family. I took this snap of my two cats. There was another better, cuter shot a day later, but I couldn’t get it to work because it was quite early in the morning and the light was poor. I think the cats are slowing down a bit now. They are only a few months off their 16th birthdays and whilst they have kittenish moments, they are getting old. Poor Amber had an alteration with another cat in the garden and he didn’t seem to be coming out best from it, so I had to scare the other cat off. Bracken has had problems with other cats bullying her in the past, partly I think because she is such a small, slight cat, but Amber is bigger and stronger, but probably considerably older than his opponent. On Thursday I had a really interesting day out at Tividale Community Primary School for the launch of Super Movers, which is a joint initiative with the Premier League and the BBC to encourage children to get active during the school day. I’ll be writing about this in more detail soon, but it was a lot of fun. 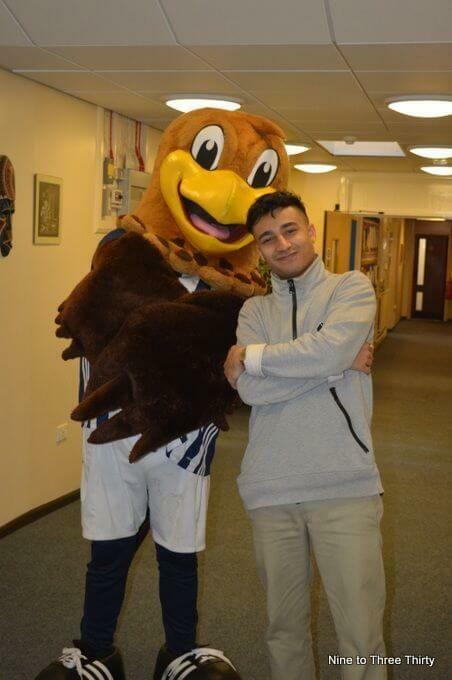 I got to meet Baggie Bird (the West Bromwich Albion mascot) and Karim Zeroual, the CBBC presenter. There was also a visit from two of the West Brom first team players, which was a real thrill for some of the kids as many of them are big baggies fans as the school is only a couple of miles from the Hawthorns, the West Bromwich Albion ground. It was a shame in a way that I couldn’t take H along as it was on a school day, but it was fascinating to see some television footage being filmed. I was really impressed by the school too as the teachers and children were all very well prepared and it seemed like a lovely place to learn. Aww! The cats are just adorable. Aww your cats are lovely! We have one too a lovely ginger tom that is now two years old. glad the motor neurone organisations have been able to support you as a family. 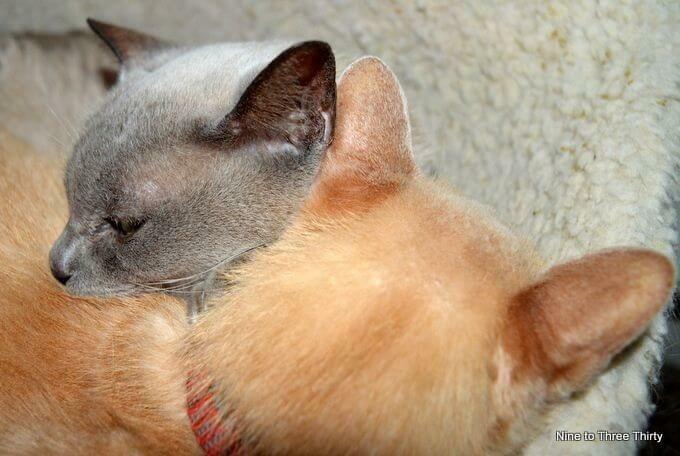 the cats look so happy together, are they ever apart? Wow, I hadn’t realised your cats were that old. No wonder they’re slowing down a bit. The morning with WBA sounds exciting and interesting, I will definitely look out for your post on that one. great idea to get kids moving during their day, I know the recommend us couch potatoes as well as sedentary job workers mover every half hour or so. Great way to get it into them so it is part of their adult life. Quite right to go out and rescue your cat, no point in allowing the elderly to be bullied. Oh hadn’t realised they cats were 16! That’s a good age isn’t it? Mine is only around 7 I think (got her as a rescue so not sure!). The photo of them together is so adorable. Glad you are getting some help and advice re the diagnosis. Your cats are beautiful! I’m sorry to hear about your mum – glad you’re getting the support though, that must be a help. Brilliant idea to get the children moving, Viggo’s preschool has a scheme starting next week and he is really looking forward to it. No wonder the cats are starting to slow down, they should be at their age!